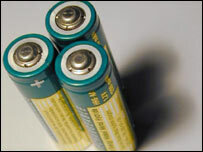 The European Union has agreed the text of a law that will make recycling of batteries obligatory from 2008. The directive will ban most batteries with more than a trace of the toxic chemicals cadmium or mercury. It says a quarter of all used batteries must be collected by 2012 - rising to 45% by 2016 - and that at least half of them must be recycled. It also says all batteries must be clearly labelled to show how long they will last, from 2009 onwards. The compromise text was agreed by a delegation from the parliament and representatives of the member states on Tuesday, in a procedure known as conciliation. Both the European Parliament and the member states will have another chance to vote on the draft directive, but texts agreed by conciliation are rarely rejected. Once the directive becomes law, states will have two years to pass appropriate national laws. The directive calls for collection points to be established where consumers can hand in used batteries - including those from toys, computers or mobile phones - and obliges shops to collect used batteries from consumers at no extra cost. It also says that all batteries must be removable, and that all producers of batteries must be registered. The recycling targets are 75% by average weight for nickel-cadmium batteries, 65% for lead acid batteries and 50% for others. The cost of implementing the new rules will be borne by industry. "The EU gives high priority to making sure that batteries and accumulators no longer cause health and environmental problems due to the heavy metals they contain," said Environment Commissioner Stavros Dimas. "The faster we start to collect and recycle batteries, the better for the environment." Mercury is a toxic metal, especially dangerous to the developing nervous system. Cadmium is carcinogenic, and lead is damaging for the central nervous system and for blood circulation. Batteries containing more than 0.0005% of mercury and 0.002% of cadmium will be banned except in emergency and alarm systems, medical equipment and cordless power tools. About 160,000 tonnes of consumer batteries, 190,000 tonnes of industrial batteries, and 800,000 tonnes of vehicle batteries are sold in Europe every year. Only six EU countries currently have systems to collect all types of used portable batteries. In 2002 the collection rates were 59% in Belgium, 55% in Sweden, 44% in Austria, 39% in Germany, 32% in the Netherlands, and 16% in France.